Beautifully situated between the hills of the bay of Canyelles Petites you'll find this small apartment complex. 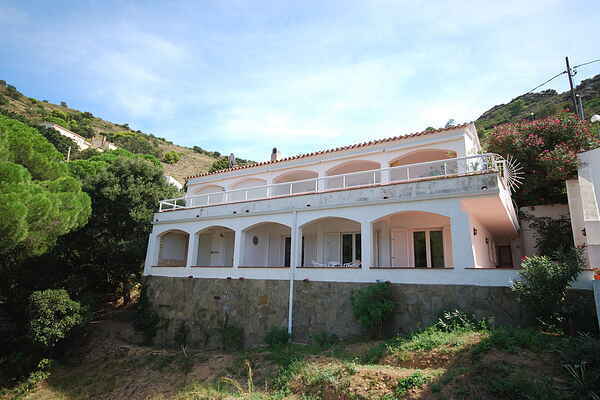 Consisting of three dwellings, each with its own private entry way and large terrace. Sun or shade: the choice is up to you. From your terrace you have a view on the bay and the rolling hills. An unforgettable view, thankfully there is a height restriction for construction. There are two supermarkets in Canyelles Petities. There is a choice from several restaurants, bars and a nightclub. More option to go out at night are in Rosas (2,5 km), the oldest fishing village of Catalonia. You would think you were in the past. Rosas is known for the many water activities. Windsurfing, sailing, waterskiing, jet ski and diving, you can do it all in Rosas. You can also play tennis, squash, go horse riding and more. Rosas is easily reached by bus. From the house you get to the sandy beach (300 m) through a challenging little road. A quiet road runs along the apartment. Using this one you'll get to one of the many bays quickly. If you want to venture further out, we can suggest the villages of Cadaqués (22km) and El Port de Selva (24 km). While you are touring, don't forget Figueras (20 km) with the Dalí-museum.